The handwriting worksheets below include practice letters on ruled lines in the Zaner Bloser style. You’ll notice that the letters include straight lines and circles instead of “tails”. 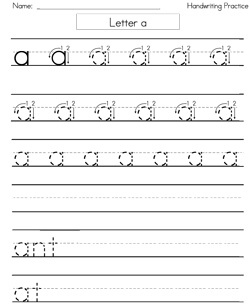 The first worksheet shown includes all 26 letters. Below that, you’ll find one sheet for each letter. Each worksheet starts off showing how to form each letter, and then provides space for children to trace and then practice writing independently. Check with your child’s school and see if they are using Zaner Bloser (block) or D’Nealian style letters. The latter is sometimes used because it allows for a smoother transition to cursive writing. You’ll need to make sure you have Adobe Acrobat Reader installed in order to view and print each worksheet. Have fun!